You CAN have style and safety all in one. The Auto Close Metal Safety Gate by Munchkin is the ultimate in baby gate technology, with a sleek steel design that keeps little ones safe. Equipped with a unique gravity-fed hinge, the Auto Close does exactly what its name implies: it closes automatically when the handle is released. And with a little extra nudge in the right direction, the door stays open, because every parent could use an extra set of hands. 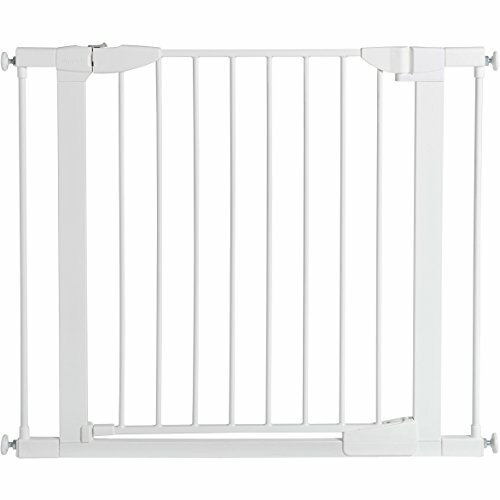 Ideal for use in doorways, stairways, and halls, this infant gate stands 29.5" tall and is easy to operate using the pull and lift handle. The included two 2.75" extensions are pre-assembled so it's ready to install right out of the easy-to-open package. Additional extensions can be purchased to fit openings up to 54" wide. Suitable for children 6 to 24 months. Installation Note: This gate ships with a gap between the gate frame and the handles. This is not a defect. The gap will close once gate is properly installed. Safety Warning: Do not use this gate at top or bottom of stairs without using all four wall cups. For maximum safety, use four wall cups with sticky pads and screws provided when installing the gate in all locations. Measures: 29.5" tall and 29.5" – 37.8" wide with the included (2) 2.75" extension (fits up to 54" wide with if additional extensions are purchased). Measure your desired opening prior to purchase to ensure a proper fit. Item number: 46760, model number: MK0006-022. Compatible extension item/model #s: 2.75" – 16161/MK0079, 5.5" 16162/MK0080, 11" 16163/MK0081.